All this week, I am previewing some fun, quick and easy embroidery kits that will be for sale in my web shop this Friday. Here's the third design - it is called "Little Yellow House". The fabric comes pre-printed. This house design offers so many ways to customize the fabric - trees, gardens, little people, grasses, flowers, bugs and more. Fun and simple summer stitching when you don't quite want to tax your brain too much - or are just beginning to learn to stitch. A perfect project for kids too. All four of these projects are open to your own interpretation. I stitched a tree but you could stitch a flower garden, a pet or anything else you dream up. The kit comes with the fabric and how-to instructions and photos of what I did. Use your own odds and ends of embroidery cotton floss. 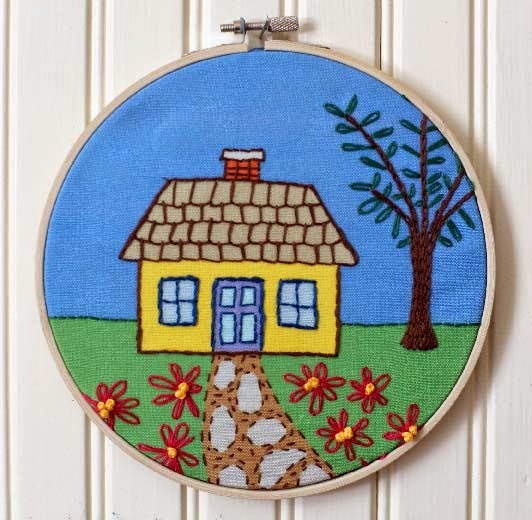 You should feel free to decorate as you wish using your own favorite stitches. When you are done stitching, there are lots of uses for these kits. 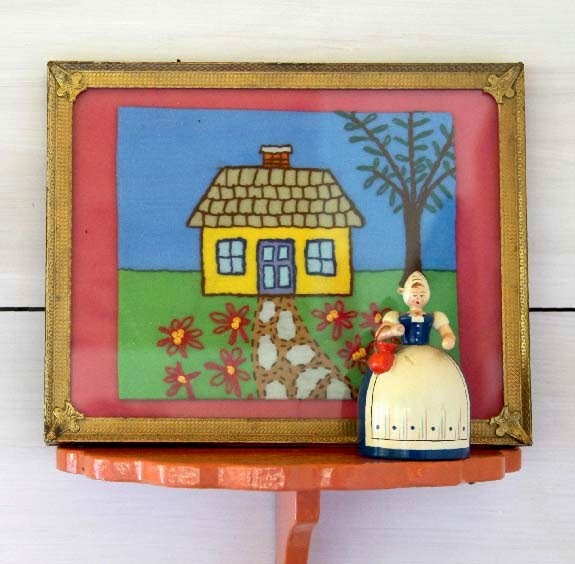 I framed my Little Yellow House in a vintage frame I purchased at a yard sale. You could use them in a quilt or frame them. Check back in tomorrow for the last design in the Vintage Country Embroidery Collection. The kits will be for sale then too. I like that ONE. "Houses" are always good. - Don't mind me, but everytime I see a NICE ceramic on one of those teeny type of Shelves, I *FEAR* for Them!! So pretty - a perfect little cottage. I'd like to live there, making patchwork quilts and tending my cottage garden flowers! The simple life - eh? I think they're a brilliant idea especially as everyone can create their own unique picture - suitable for beginners right up to experienced stitchers. Great idea - hope they do really well.